We will be closed from noon December 24 until December 26, and from noon December 31 until January 2 to spend the holidays with our families. Limited staff are available to respond to customer requests until January 5. We appreciate your patience if it takes a bit longer for us to respond than is typical. Announcing Carbon Copy Cloner 4! I introduced Carbon Copy Cloner on January 18, 2002. That was such an exciting time -- Mac OS X was so new, nobody else had figured out how to clone it, and many people thought it was impossible. I love to surprise people! 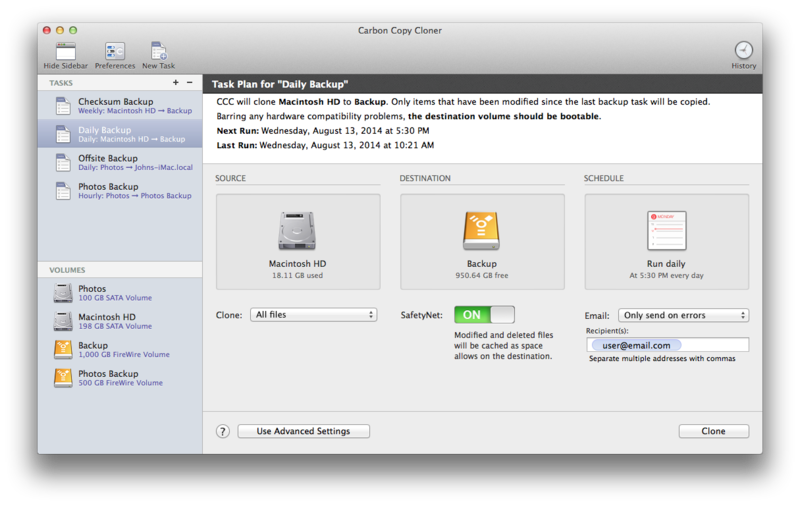 Over the past 12 years, CCC has grown into more than just a basic cloning tool, it's now a feature-rich backup application with support for backing up to and from network volumes and disk images, copying between folders, even cloning across the Internet to another Mac. As exciting as the last 12 years have been, it doesn't compare to how excited I am to announce our biggest release ever: Carbon Copy Cloner 4! In the past 18 months we've torn CCC down to studs and completely rebuilt it on top of modern OS X facilities. We've added many features that our users have been requesting -- editing scheduled tasks, simpler settings, a menubar application for quick access to information about backup tasks, detailed task history and so much more. If you're running Mountain Lion or later (yes, Yosemite too), you can download CCC 4 and try it yourself, I know you're going to love it! We're offering a very generous lookback period for people that purchased a CCC 3 license recently. If you purchased a license since Apple previewed the Yosemite OS on June 2, 2014, your upgrade pricing is $FREE! Simply download CCC 4 and open it. Upon discovering your CCC 3 license, CCC 4 will request that your new license be sent to you via email. For people that purchased a CCC 3 license prior to June 2, 2014, you can purchase an upgrade at 50% of the list price ($19.99 USD). Again, download CCC 4 and open it. When CCC detects your v3 license, it will automatically retrieve a coupon that you can use to purchase CCC 4 at the upgrade price. If you don't see this pricing automatically, check your license for eligibility here. Carbon Copy Cloner 4 has seen over 18 months of development and thousands of hours of beta testing. We have a rigorous QA procedure that involves automatically-performed unit tests and over 450 tests that must be performed manually under specific test conditions. These tests are time consuming, so we perform the complete qualification on production operating systems only. CCC is fully qualified on Mountain Lion and Mavericks. Why doesn't CCC 3.5.x run on Yosemite? In the last several years, Apple has demonstrated its intention to push out a new operating system on an annual basis. Concurrent to those new OSes, users see updates to nearly every application they use -- updates that accommodate changes in the new OS. Some updates are small -- minor bug fixes, while others are large, e.g. to accommodate major new OS features. Carbon Copy Cloner is no different, each OS brings not only user interface changes, but also changes to various filesystem and networking features that directly affect how CCC can perform backup tasks. Carbon Copy Cloner 3.0 was developed between 2007 and 2009, so it was based on OS X system facilities that were available on Tiger. Between then and now, we've updated CCC 3.x to add support for new OS features, such as HFS filesystem compression, Notification Center, the Recovery HD partition, full disk encryption, and new sleep/wake mechanisms. But there are architectural limitations to the choices that we made back in 2007 that can't simply be updated piecemeal. While we've worked really hard to make Tiger-age technologies work for us on newer OSes, these most recent OS releases have painted a very clear picture -- it was time to retire the old architecture. That decision was made just in time, because our worst fears were realized in Yosemite's earliest developer previews -- CCC 3.5 was badly broken on Yosemite, and we were facing many, many months of work to get it working reliably. At that time (shortly after the Yosemite announcement), we were at a fork in the road. We were nearly finished with a new generation of CCC -- just months away from releasing it. Do we put that work on hiatus for another year and invest precious development resources on bandaid solutions, only to face an unendurable support avalanche when Yosemite arrives? Or do we tear off the bandaid and invest all of our resources into the next major release of CCC, which was nearly ready and already working on Yosemite? The decision was painful, but it wasn't difficult. Investing in 7-year old technology just isn't a winning strategy, not on Apple's platform, not with Apple's "pace of innovation". Finally! We're ready to open the CCC beta testing gates! I know, you all have been waiting forever for this, right? You probably think we're taking our sweet time getting CCC qualified on Apple's next OS, but I want to assure you that that couldn't be further from the truth. Apple has finally resolved a showstopper bug with the release of a seventh developer preview, and now we're ready to open up our own beta testing program. I'm sorry it took this long, but that's the nature of beta OS releases -- they have bugs! We're testing more than just an update for Apple's next OS, though. Our team has spent the last 18 months tearing CCC down to studs and completely rebuilding it. I'm very proud to announce the next major version of CCC: Carbon Copy Cloner 4. The complete list of changes could fill a book, the really long list that I've included below is just the big stuff. The main task configuration window and the scheduled tasks window have been consolidated. Tasks can be saved, scheduled, and edited, all in the same window. Configuring a backup task is far simpler -- complex settings are hidden by default, but accessible at the click of a button. Menubar icon indicates whether a task is running, and a simple icon next to each task indicates progress. A Task History window indicates when a task ran and whether it was successful. All history events are listed in one window, and can be sorted by task name, source/destination name, start time, and status. Email account settings are now specified in CCC's preferences. Test email notifications are now much more proactive about reporting configuration errors. Will CCC work with [insert Apple's pre-release OS here]? Every time Apple makes a new operating system available to developers, we spend several weeks evaluating CCC on that new OS. We look for changes to the features and behavior of the HFS+ filesystem, how the new OS supports (or fails to support) network filesystems, changes to the boot process, changes to support for USB, Firewire, and Thunderbolt -- and a bunch of other things. If nothing has changed and no problems are encountered, the process takes a couple weeks. Realistically, it takes at least three weeks to complete qualification, and in the worst case scenario (e.g. Snow Leopard and Lion), it takes several months to fix problems or add support for new OS and filesystem features. It's a lot of work -- a lot more than the average developer would face when a new OS is released because our software relies so heavily on filesystem functionality and operating system behavior (especially stuff that is poorly documented or not documented at all, like the Recovery HD). We clone the OS, and when Apple ships a new OS, we'd better be doing that correctly. Evaluate functionality on the Developer Preview. Identify major problems and develop a strategy and timeline to resolve them. As problems are addressed, we may post betas for external evaluation. When the GM is announced and delivered to developers, we complete final qualification. Our final product is ready when the "Golden Master" is made available to customers on the AppStore. It would be foolish for us to complete a thorough qualification on the Developer Preview because a) the Developer Preview is usually quite buggy and Apple's bugs waste my time and b) qualification on the Developer Preview has no relevance to the final product -- we would have to repeat qualification as soon as the Golden Master is posted. Based on experience with past OS X releases, cloning software should not be used to clone new OSes until it has actually been tested on the new OS. While that seems like a common-sense statement, it's apparently not a common practice. That's our policy, though, and that's why you get a dialog that says CCC isn't qualified on Yosemite. Last year, I had time set aside to produce a beta that would work on Mavericks shortly after the Developer Preview was made available. The announcement of Mavericks was highly anticipated, so I could budget my time really well. This year, Yosemite came with less warning. As a result, I'm in the middle of other work that can't be set aside to start Yosemite evaluation. I plan to start evaluating Yosemite in a few weeks, though, and I hope to provide a beta once any surprises are sorted out.